It’s been almost 9 months since my husband and I got married back in February this year. 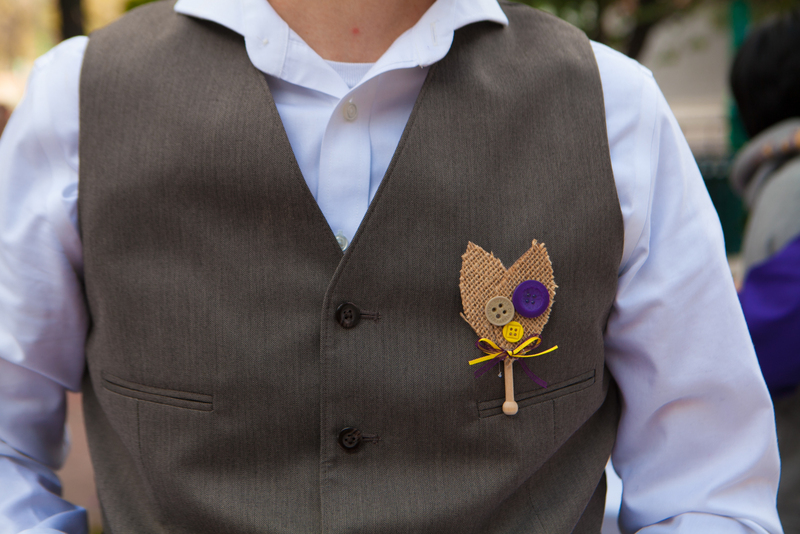 I thought it was time that I posted pictures of more handmade details from our wedding. 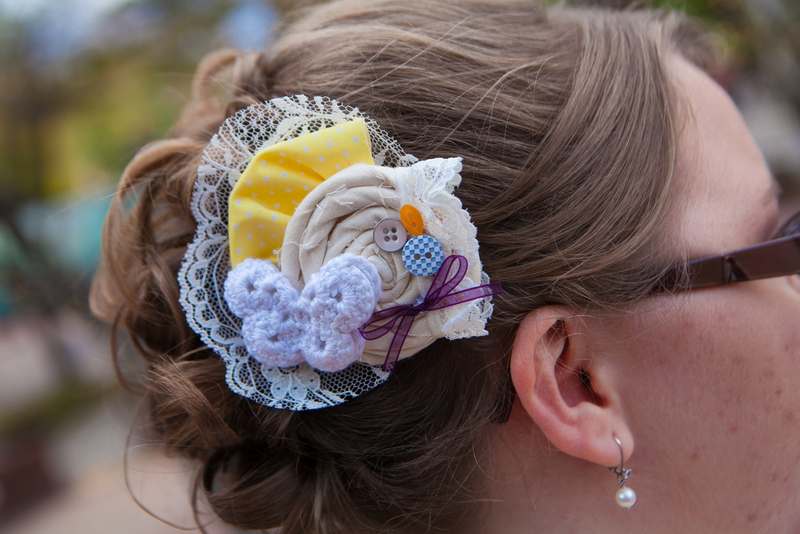 Since I want to be able to share what I did with others for inspiration, I’ve also added a new page titled Handmade Wedding where you can see all the details. Click the link in the top menu to see more! It was a lot of work, but so worth it to have the wedding of our dreams. 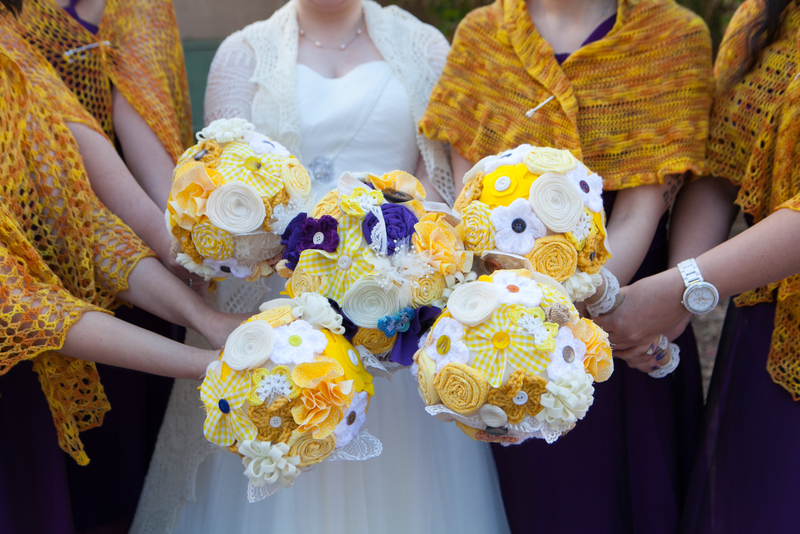 Also, we saved a ton of money by making our own stuff, especially on the bouquets. 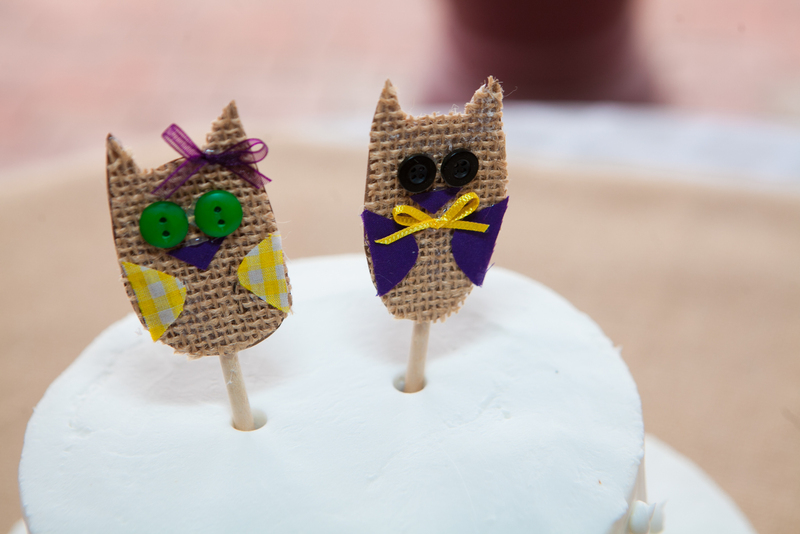 I spent about $150 for fabric (including a bolt of burlap) and supplies that made all the bouquets, boutonnieres, corsages, cake toppers, my hairpiece, decorated the flower girl basket, and the unity candle set, as well as cut out burlap squares for all the tables. My wedding shawl was free because the yarn was a gift from my parents several years prior to the wedding that I had been saving up. 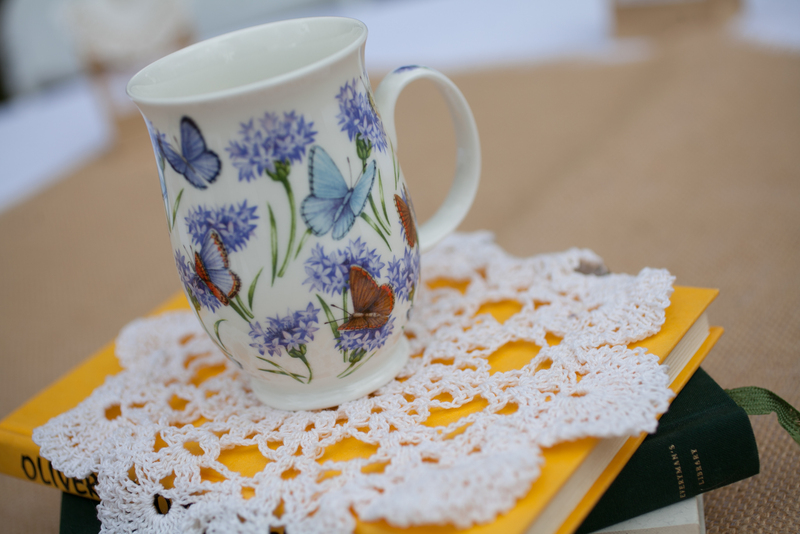 The doilies, books, tea cups, and other decorations were all free because I just used what I had. The only decor we purchased was 12 mason jar mugs that we filled with peanut M&Ms (and now serve as our drinking glass set), the supplies for a thumbprint tree guest book, and the plain white candles and candle holders I bought to decorate as our unity candle set. The main thing I didn’t want was a bunch of decor stuff purchased for the wedding that then served no purpose afterwards, hence the reason why we used a lot of what we already had, which made it that much more personal. 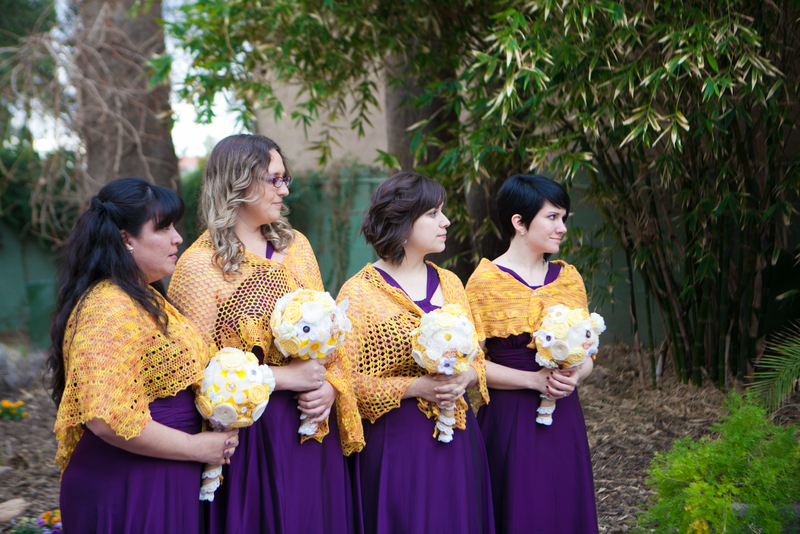 If you are interested in a hand-knit wedding shawl, hand-crocheted doilies, or other knit or crocheted items for your wedding, please visit my Custom Orders page to fill out a request for price quotes and time estimates. Because I was keeping my wedding shawl a secret from my husband before our wedding day, I wasn’t able to post pictures about it on the blog. Now that we’re married, I can post about it. I was glad to have this shawl on the day of our wedding, since it was about 55 degrees outside the whole day. I couldn’t bear to put it away, so I also wore it during most of our outings on our honeymoon in Payson, where it snowed the 4 days we were there. This shawl will be a special one to wear on our anniversary every year, as I will always remember wearing it on our wedding day.